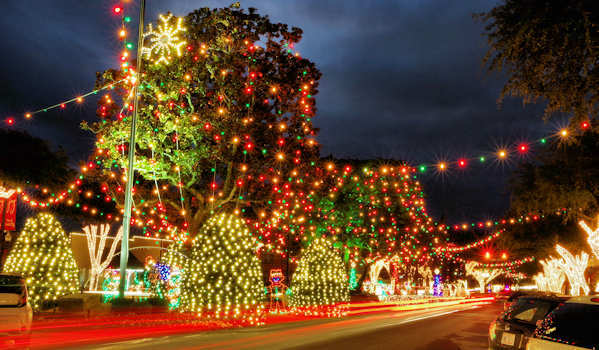 For the ultimate festive small town experience to get you in the holiday spirit, drive and stroll down Main Street decked out with a million lights for Hometown Holidays in our top "Christmas Town" Forest City in Rutherford County. Wrapped around the live oak trees and hanging overhead, the displays center around the town fountain. 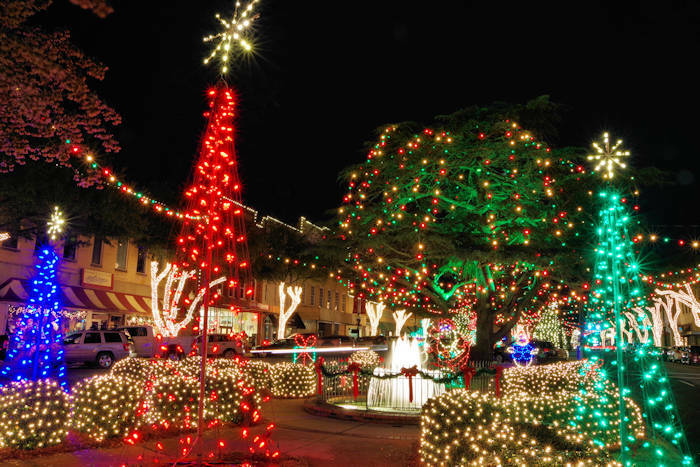 The tradition dates back to 1930 when the town hung its first set of lights on two trees. 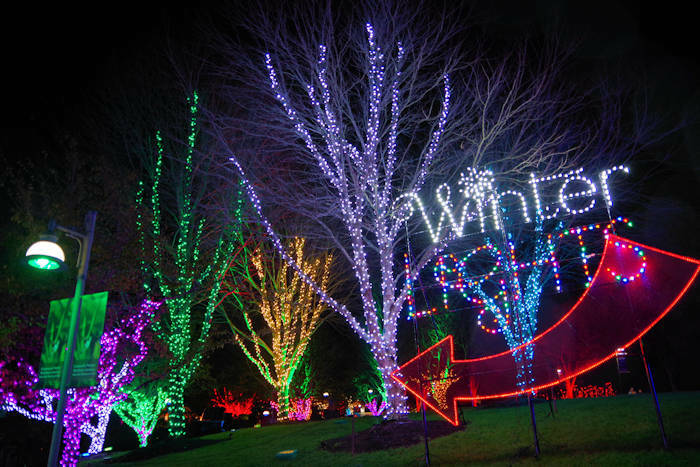 Bundle up with a cup of hot chocolate and hop on a carriage or hayride (offered on weekends) through the magical display of holiday lights. Read more about Forest City. Join the kick-off celebration from 6-9 PM with the annual lighting ceremony. Enjoy favorite Christmas songs by a local quartet. Stroll down Main Street to Santa's House for complimentary hot chocolate and cookies and visit the ice-skating rink. Stores and restaurants will be open and a DJ will play Christmas tunes at the Fountain throughout the evening. 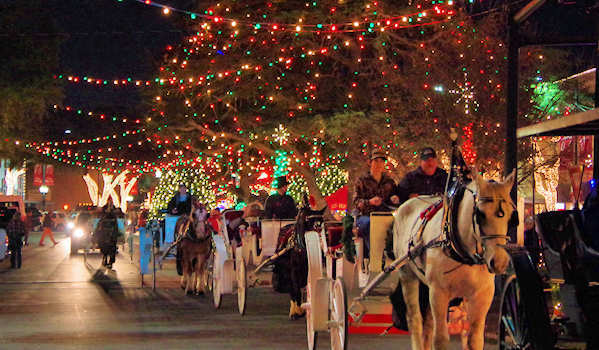 Iconic small-town America festive evening - just like a Hallmark movie! Starting at 3 PM, watch the much-anticipated annual Christmas parade on Main Street - starts at McNair Stadium and ends at First United Methodist Church. Visit Santa's House (6-8:30 PM), go ice skating (6 PM until) $8/person includes skates and take a hayride (6-9 PM) $2/person through the lights. Live music too. These activities are cancelled if rainy or snowy, but lights shine no matter the weather. Visit Santa's House (5-8:30 PM), go ice skating (5 PM until) $8/person and take a horse drawn Carriage Ride (6-8:30 PM) $10/adult, $5/child. Live music. 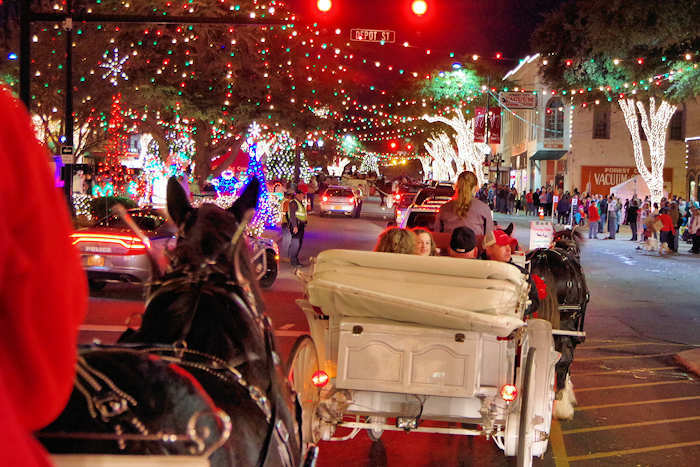 For carriage rides, line up early at the corner of Main & Mill Street. There's usually a long line and often sells out early, but there are many carriages going so the line moves quickly. These activities are cancelled if rainy or snowy, but lights will shine. See decked out Christmas floats, fire trucks, dance teams, marching bands all ending with a visit by jolly old St. Nick himself. Enjoy many activities in the Main Street Park. Spindale Parade begins at 3:30 PM, Rutherfordton Parade begins at 5 PM. Also enjoy many decorated store live window displays along Main Street. 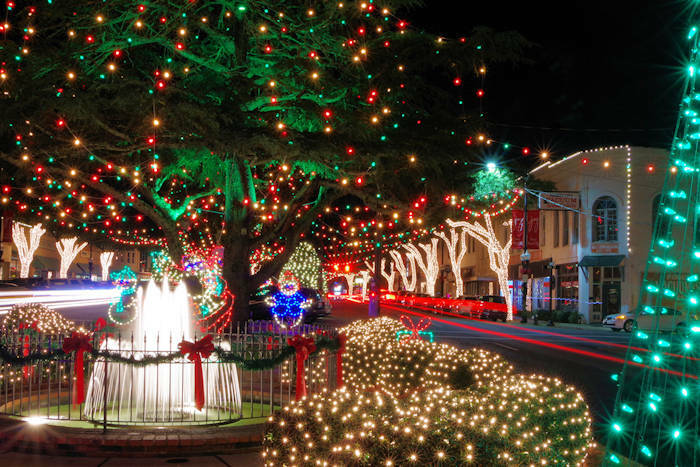 Rutherfordton Tree Lighting (NC's largest living Christmas tree) and Jazz concert at 6 PM. Read about Rutherfordton & Spindale. Watch Santa practice his climbing skills on the biggest chimney around at Chimney Rock Park. Read more! 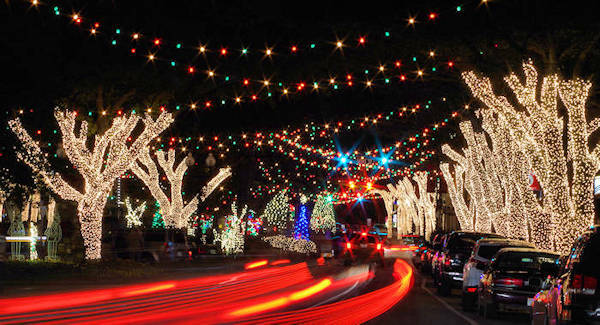 Stroll Main Street to see the Christmas decorations and lights. Shop at a variety of local stores and galleries or dine at one of the cafes and restaurants, all open with extended hours. Read about Chimney Rock Village. Copper Penny Grill, 146 E. Main St. Twisted Pear,184 E. Main St with choice of 200 beers and live music. 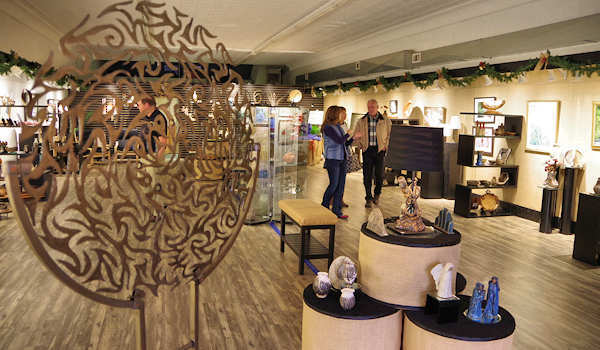 Don't miss Banfield Gallery at 171 East Main Street (pic above) with works from 20+ artists including owners Tom & Kathy. They are open until 8 or 9 PM most nights. Another great stop is Mirror Mirror at 106 East Main. Forest City is located about 60 miles southeast of Asheville - about halfway to Charlotte along US Highway 74. See our Forest City Guide for more things to do nearby. Come early to visit a winery in the Tryon Foothills Wine Country. The "big city" 1,300-seat performing arts center is located on the Isothermal Community College Campus in tiny Spindale and features an impressive Mainstage Performing Arts Series featuring music, dance, comedy, theatre and more. Find plenty of unique inns, bed and breakfasts, local boutique hotels, cabins and campgrounds near all the things to do in Lake Lure, Chimney Rock, Rutherfordton and Forest City.